Yesterday, John Miller hosted the first operating session on the new version of the K&LE (4.0) and it truly was an amazing day. It's hard to believe that the last session on the old railroad was held in October of 2014. You can see pictures of it here: http://cwerailroad.blogspot.com/2014/10/last-run-of-k.html. What has been accomplished since the last run is just incredible. Here are some shots from the session. The photo below shows the view looking down Undercliff Yard toward Oasis Yard and the steel mill in Newport, KY. Terry Luginbuhl is classifying cars for locals in Oasis Yard. In the next shot, Bill Doll is working the east end switcher in Undercliff. East is to the left of the picture- no one was really sure where Bill was headed with his locomotive. Next up, Gerry Albers is working one of the many local jobs. The Eggleston Avenue switching district on the new railroad is longer and much more complete than the previous layout. In the picture below, Keith VandeStadt has just received a cut of cars from Oasis and is preparing to work the many industries in the district as Dan Hadley looks on. Next up are couple of shots of some of the completed areas of the Eggleston Avenue district. As can be seen from the photos above, John really has a knack for capturing the colors, look and feel of the old industrial areas of Cincinnati. 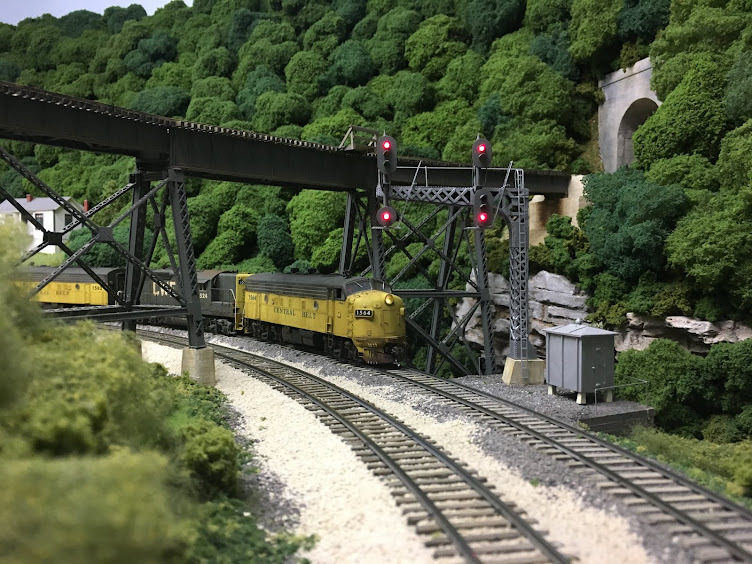 In the next photo, Chris Wermuth is taking a train west out of Undercliff while Gerry works another switching district- all under the watchful eye of the superintendent. Here's another view of Oasis Yard looking in the opposite direction from the view above. Next up, Randy Seiler looks on as Jim Rollwage works the west end switcher at Undercliff. Oasis Yard is in the foreground. Some foreign road power appeared during the session as is evidenced in the photo below. And the lunch- oh my goodness! John's wife Page prepared rib-eye steaks, baked potatoes, corn on the cob and a tossed salad. All of which was followed by lemon bars and brownies. I think it's a safe bet that none of us have ever eaten so well at an operating session. Thanks again, Page- it was wonderful. My apologies for the quality of the photos- they certainly don't do the layout justice. One must really see it in person in order to completely understand the size, scope, and attention to detail. But I think I can speak for all of us who attended in saying that it really was an amazing day. While we all enjoyed the previous railroad immensely, it's clear that version 4.0 will be even more incredible. Congratulations, John, on a job well done. You've achieved more than any of us thought possible in such a short period of time. And thanks again for the invitation- it was wonderful to be able to share in the inaugural session of 4.0.